It has become rather unusual that less than a year passes between the releases of a Genesis solo artist – unless that artist is called Anthony Phillips. Steve Hackett now shows that it is possible. Blues With A Feeling, his new album, is about 45 minutes long and comes out in the UK on 19/09. Since Billy Budis [Steve’s manager at the time; ed.] was so kind as to send us an advance copy of the album we can already tell you something about the twelve new songs. The album title reveals that Steve focuses on what is a new musical style for himself. The music is a mixture of various types of blues and a good deal of rock. It was recorded with much the same crew of musicians and producers that worked on Guitar Noir. Doug Sinclair, who played bass on Steve’s previous tour, has replaced Dave Ball on most recordings for the new album. Hackett also brings in a horn section: The Kew Horns provide a real brass sound on three pieces. The record can be divided into three musical categories. The first consists of typical blues compositions by other artists: Born In Chicago, The Stumble, Blues With A Feeling and So Many Roads. The highlight is The Stumble, an instrumental boogie a la Status Quo. The second group is made up of blues and bluesy pieces Hackett wrote on his own or with the band: Way Down South, A Blue Part Of Town, Footloose and The 13th Floor. A Blue Part Of Town stands out as a blues ballad arranged for electric piano and mouth organ. Hackett compositions that do not have much in common with the blues fall into the third category: Love Of Another Kind, Tombstone Roller, Big Dallas Sky and Solid Ground. Tombstone Roller with its very odd time signature (1/4) and interesting voice effects is the highlight of this group. Solid Ground is another pleasant surprise; it showcases a new style in Steve’s expanding command of vocal styles. 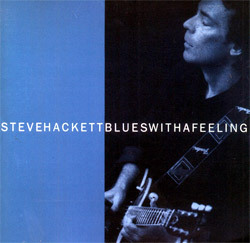 Blues With A Feeling shows that Steve’s way of singing has kept developing since Guitar Noir. The songs were compiled into a very entertaining mixture from all three groups. This album does not become boring or a nuisance even if you are not really into blues. After Gabriel’s trips into the soul and Collins’ jazzy B-sides Steve is now the third artist from the Genesis camp to rediscover his musical roots. If you like Steve’s style in general and if you enjoyed the second half of Guitar Noir in particular you are going to like this album. One should not make the mistake, though, to compare Hackett to the eternal blues stars. Steve did not intend to record the ultimate blues album – he simply wanted to discover something new and to fulfill one of his dreams. 2nd Soloalbum from 1977 feat. Richie Havens among others.